Thanks for visiting this resource page. Here you will find everything you need to book a Zero Fatalities Tour presentation. What makes John story special? Why book a Zero Fatalities Tour Presentation? What is the cost of a presentation? Don't forget to scroll all the way to the bottom. There's a lot of info on this page and if you need something more please let me know. ​Thank you for taking the time to consider hosting a presentation and thank you for making a difference in your community. With your support the #ZeroFatalitiesTour2018 will be a success and your community will be safer. Contact me today to book your presentation. ​If you have any further questions, do not hesitate to contact me. 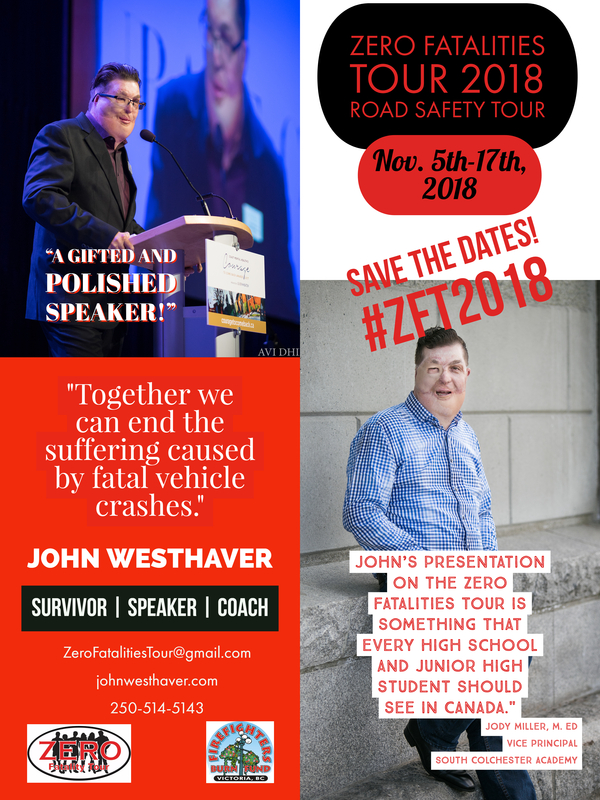 ​In November 2018, John Westhaver, native of St. Stephen NB, currently living in Victoria BC, will be returning to Atlantic Canada for his third annual Zero Fatalities speaking tour. John is the recipient of the Queen Elizabeth II Diamond Jubilee Award and a the Coast Mental Health Courage To Come Back Awards. He has been speaking to audiences across North America since 2002. Every year there are fatal crashes across Canada involving both our youth and adults. John is making a difference in communities across North America by sharing his story of the crash that changed his whole life at only 18 years old. He is passionate about changing the way we make choices while driving and being passengers in a vehicle. His goal is to end fatal crashes and the suffering that these fatal crashes cause in our communities. This is a video interview on Facebook LIVE about the Zero Fatalities Tour happening this November. Have a watch. What makes John’s story special? John will share his story about being an impulsive 18 year old, not worried about the “what if’s”, and the choices he was making as a teenager. He, as most of us do or have done, was just living life to the fullest with a world of possibilities in front of him. We are all invincible in our youth, right? His story is impactful, and relates to the youth in a way many other presentations just cannot. When John walks into the room, you will notice the scars on his face caused by the fatal vehicle crash from his youth. Through the course of his presentation, he will also share the emotional scars and impact a crash like this has on an individual, families and a community as a whole. John was involved in a fatal vehicle crash when he was 18. This crash not only left John with life threatening burns to 75% of his body, but it took the lives of three of his close friends, one of which was his best friend. He has been through one’s worse nightmare and has made a miraculous recovery. John talks about choices, the consequences of making poor choices and the power in making good choices. He shares with the audience the impacts of the choices he and his friends made on that fatal night. He also talks about the choices that he made during his recovery, that had him make the miraculous recovery, turning this tragedy into a triumph. He is a passionate speaker who captivates audiences of youth and adults alike. John helps students think about their options, and gives them something to remind themselves to be safer drivers, and thoughtful passengers. Why book John to speak? Book John to speak because you believe in the power of his message, this tour and the difference this tour will make in your community. Have this be another way you give back to your community and make it a safer place to live. When you end fatal vehicle crashes, it reduces the financial impact on the community. Your insurance rates reduce, your medical and emergency services are freed up and thus reduces the cost through taxes. There isa huge ripple effect when you end fatal vehicle crashes. Do it because you care and want nothing more than to give back to your community. What is the cost of the presentation? Presentation Fee during the tour is $750 if 10 or less schools are booked. If more that 10 presentations are booked the fee will be $500 per. These fees are special rate subsidized by the sponsors. Consider booking with another school to cost share the fee. John is seeking sponsors for this tour to ensure the costs are lower for the schools and organizations who wish to have him speak. If your school is interested in hosting a presentation, please contact John to discuss your options and confirm dates. Call Now To Book 1-250-514- 5143 or click below to submit a request for presentation. Thank you for your business and the opportunity to make the difference in your community. Here are some pics of the previous tours including the Sponsors. This is the powerpoint presentation that will be used during the Zero Fatalities Tour 2018. I share this with you so you can review the keynote. I trust you will find value in this powerful presentation. Here are a few documents that I thought you might what to share or download or print. This is a downloadable, shareable or printable document if you need one.